The best possible termite protection you can have. 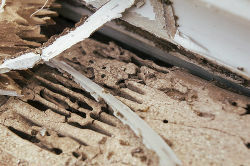 Many people fail to realise, until it's too late, the extensive amounts of damage that termites cause to modern homes. Since they remain concealed in the wood, and enter your home through underground leads, it is often not until the damage is extensive, and timbers collapse, that you realise you have a problem. Termites, or white ants as they are commonly known, cause serious structural damage to timber and other cellulose-based products. The most common species, Coptotermes acinaciformis, is in fact the most destructive termite species in the world. Studies have revealed that as many as 1 in every 5 homes are attacked at some stage during their lives by this ruinous insect. Clearly it is important to take every action possible to prevent their menace. The most commonly encountered termites are subterranean termites. Living in large underground nests they travel through the soil and then build mud tunnels to gain access to the timber in your home. Once inside, the worker termites chew up the timber to feed the nest. This frequently leaves timbers hollow inside and structurally unsound. Chances are - very little. In fact, you may not even know you have termites in your home, until it is too late. Our most important termite species live in underground nests containing up to two million wood eating termites. That's a lot of hungry mouths that travel fifty meters, or more, in search of food, and your home provides them with a smorgasbord to feast upon. The trouble is, as the termites travel underground, and enter your home by concealed mud tunnels, you may have no idea they're ready to devour your place. Termites get right inside the timber to feed. So they may be feasting away, hidden in your walls, or hollowing out the support timbers in your roof, without you knowing. They could also be dining on the timbers in your subfloor. And please don't thing just because you homes is built on a concrete slab you're safe from marauding termites. Termites build shelter tubes over the edge of slabs, or enter through shrinkage cracks around pipes. When they're hungry, and that's all the time, nothing will stop a termite grabbing a quick lunch. An extensive Australian Standard (AS3660-1993 Protection of buildings from subterranean termites) deals with protecting homes from termite attack. This standard provides minimum guidelines for homeowners, builders and pest controllers on termite control and prevention. The Building Code of Australia, which is administered by local government authorities, requires that various measures be taken when your home is built. In the past highly persistent organochlorin pesticides were sprayed underneath slab on ground homes. Organochlorins have been withdrawn from use, due to community and environmental concerns, and replaced with more acceptable alternatives. Applied correctly these alternative control agents will help protect your home from future attack. Termites may still gain entry though if you don't take basic steps to help maintain the defenses to your home that have been put in place by your Termite Engineer. The Australian Standard and the Australian Building Standards Advisory Council recommend inspections at least every 12 months. Natraspray will perform this inspection for you. One of our fully qualified Termite Technicians will perform a thorough survey of your property, including the garden area and trees where termite nests may be found, and provide you with a full written 8 page Report detailing the results of his inspection. Appropriate recommendations on treatment and measures you should take to help endure the security of your home will be outlined. If you find any evidence of termites, damaged timbers, mud workings, then immediately contact your licensed Termite Engineer. Do not disturb the workings in any way. Left undisturbed your Termite Engineer will be better able to tailor an eradication program to suit your home. A termite barrier abutting the perimeter walls of your home is essential to protecting your home. You must avoid disturbing this barrier. If it is disturbed then entry by subterranean termites is possible. If you have not had this barrier applied yet then your home remains fully exposed to future destruction by termites. Any termite protection program can be rendered ineffective if building alterations or additions are made. The construction of pergolas, awnings, veranda's, etc can provide a route of entry into the protected property. Ensure leaking taps, showers, pipes, etc under the home or adjacent to it are immediately repaired in order to reduce moisture levels in the sub floor. Ensure that vents to sub-floor areas are never blocked. These keep the subfloor dry so termites are not attracted to the area. Do not use untreated timbers to form garden beds or retaining walls, as these will attract termites. 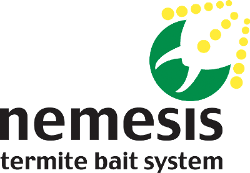 Nemesis is an Australian termite bait system designed to attract and eliminate termite colonies in a safe non invasive way. It uses an insect growth regulator (IGR), Chlorfluazuron, as the active constituent in the Nemesis bait. Active termites feed on the highly attractive bait food source and trans locate the IGR to other members of the colony, at levels undetectable by those termites, until the colony collapses. Nemesis termite bait is a registered product under the requirements of legislation administered by the Australian Pesticides and Vetinary Medicines Authority. This termite pest control system uses a number of unique stations for in ground and above ground interception of active termites. Once the termites have entered the Nemesis stations and are feeding on the timber, the bait is placed into the station. The Termites quickly start to feed on the Nemesis bait, taking it back to the nest. The Termites cannot detect that the bait is slowly affecting their ability to grow and develop, stopping the termite colony being able to reproduce, therefore eliminating the nest. 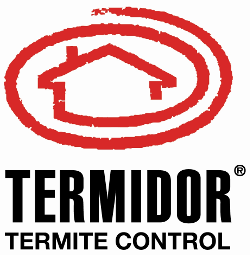 Termidor is applied by licensed pest controllers to soil areas abutting a building in order to eradicate termites as they attempt to gain entry into the building. This provides immediate protection and reduction of risk of on-going expensive structural timber damage from a termite infestation, of a kind not available from alternative termite baiting systems. In addition, termites in contact solely with a lower concentration area, such as, in the out-reaches of a Termidor treated soil area, will not detect it's debilitating effect until a few days later - enough time to routinely transfer the Termidor active ingredient to other termites they contact. This delayed accumulative lethal effect of Termidor, aimed at eliminating the entire colony, is discussed in detail later on. Termidor works quite differently from other Termiticide soil treatment pest control products which are repellents, in effect designed to repel or keep termites away from a treated soil area, rather than killing them. This means any minute gap in the treated soil can be detected and exploited by the termites to gain entry in the building. This is a major short-coming of the old-fashioned termite pest control alternatives, far too often, with financially disastrous consequences. Termites tunneling in higher concentration Termidor treated soil areas abutting the building are killed outright, within a few hours. Termites tunneling in the outer reaches of a Termidor (lower concentration) treated soil area, cannot detect the Termidor chemical which readily sticks to the termites body. These termites remain unaffected for a few days, before sudden death occurs. This delayed lethal effect provides enough time for the Termidor chemical to be transferred back to the central colony nest to infect other termites. The "carrier" termites are able to readily spread the Termidor chemical to other termites during regular physical contact with other termites in the colony, particularly when working together in close proximity, grooming and feeding other termites, a regular function of their daily life. Termites cannot detect the Termidor chemical as it has virtually no odour, taste or smell to the termites. Termites cannibalize or carry away dead termites killed by the Termidor on their bodies, further spreading Termidor's deadly effect to other termite colony members. As with any termite pest control program, your property always remains susceptible to future attack from new termite colonies or other established colonies in your area. The good news for the homeowner is that the Termidor soil treatment chemical will remain in place for many years even after the existing attack on your property has been eliminated. In brief, Termidor treated soil acts on an on-going basis to prevent termite entry through a treated soil area into a building or other protected structures. Such a chemical soil barrier under and around the external perimeter of a building is a pretty big target for the foraging termites to hit, rather than scattered bait stations around the building! Termatrac is a breakthrough development in the detection of termites, invented and developed in Australia using technology similar to radar. Termatrac is the answer to detecting termites through timber, plaster board, brick or masonry with no interference to the building material or termite activity. Termatrac emits signals which penetrate the material that is being searched. Any termite activity interrupts the signals and Termatrac relays this information to the operator, allowing them to pinpoint the termites in an instant. The operator can then track the termites back to the entry point and assess the extent of the termite activity without disturbing them. In protecting against termites, the basic idea is the same in all homes: treat the soil around the house to form a barrier that termites cannot penetrate. Because termites can move through the tiniest cracks in concrete or metal, the barrier must be absolutely continuous. Even the smallest break in the barrier can let termites in. This means we've got a lot more to do than just treat around the perimeter of your house. While that takes care of the biggest stretch of the defence we put up, there are lots of other places that need special treatments. Here are the things we do to make sure the barrier is continuous. Not all of the activities are listed will be done as we customize our treatment depending upon the structure treated, termite species and activity, product label restrictions and State laws. In some situations, specialized equipment may be used. Step 1 is a thorough inspection to look for activity, identifying the termite species involved and to note conditions conducive to termite problems. We will also indicate to you that corrective measures we recommend you take in addition to our treatment activities.